This 2007 thriller is sort of like a modern-day remake of “Psycho”. But comparing it to the Hitchcock classic would be way overselling it. Starring Luke Wilson and Kate Beckinsale as a feuding married couple headed for divorce. They have recently lost their son in some kind of accident and are still dealing with a fair amount of guilt and grief. Upon returning from a relative’s house they get lost on a back road shortcut and end up at the Pinewood Motel with car trouble. Yeah, not the most creative or original opening but this flick has its moments. 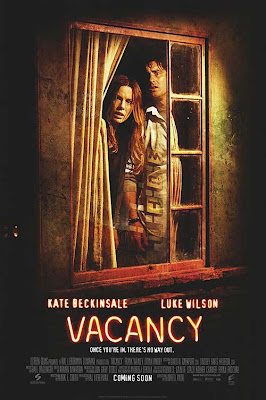 Anytime a movie has a creepy, rundown motel with an eccentric owner, obvious comparisons to “Psycho” will ensue, and nothing can top “Psycho”, nothing! When our hero couple gets to their room, which is pretty nasty when it comes to cleanliness, things start to happen. Someone keeps knocking on the door and leaving before they can answer. Those bastards! The movie does build a decent amount of tension, especially when Luke’s character puts in a VHS tape and it looks to be a homemade snuff film. And get this, it was filmed in their very room! The embattled couple must work together to get through this ordeal alive. Screw marriage counseling, people just need to be hunted by homicidal maniacs to sort things out. Seeing that they don’t want to be the stars of motels new film, they try several times to escape but with no success. As the standard in movies like these, a local cop comes to investigate things only to be killed. The couple does find something in the bathroom, which could be called a twist in the story, but is pretty weak if you ask me. The filmmakers tease you with the possibility of a dark tragic ending but eventually chicken out and go for the completely illogical “happy” ending. This movie is not great, but it’s not total crap. Like a lot of things, it lingers in the realm of mediocrity.